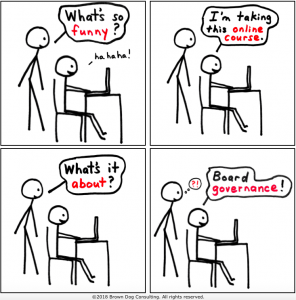 About two years ago, a very insightful client of ours suggested we make the ‘flipped classroom’ concept available for Policy Governance orientation. When so many boards are pressed for time and resources for high quality training, we took this suggestion to heart. 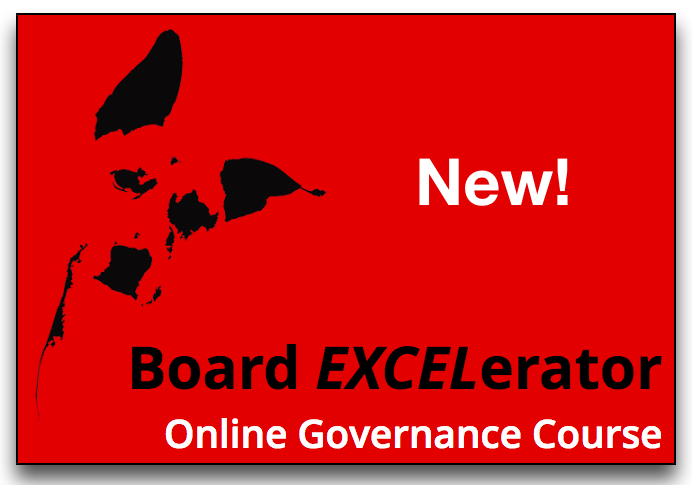 Brown Dog Consulting is now happy to offer clients an innovative new online learning program that orients board and staff members in the theory and practice of Policy Governance. Govern With Confidence: 10 Key Principles for Effective Board Leadership (short title – Board EXCELerator) delivers all of the core content necessary to understand what Policy Governance is, and how to benefit from applying its 10 principles. Participants are guided through all 10 principles via eight course modules featuring audio clips, short videos, illustrated slides, and quick quizzes to confirm that key points are understood every step of the way. The course also includes discussion guides that boards can use to stimulate group conversation during board meetings, plus practical application tips and one-on-one coaching for each course participant. Boards can use this course to orient new board or staff members, to refresh memories of Policy Governance training or books read in the past, to get all board members on the same page with respect to the application of Policy Governance principles, and to prepare board members before hosting a facilitated board retreat. When all board and staff members understand Policy Governance principles before attending a face-to-face workshop, participants can delve more deeply into important issues and perform at a much more advanced level. For more information about this innovative new way to save board meeting time and resources, and to accelerate your board’s performance, please connect with us and we’ll get the ball rolling!